They don’t have enough power to put Hillary Clinton or Donald Trump in the White House. But they carry the pressure and the blame when things don’t go well for their parties in in this crucial corner of Ohio. Hamilton County Republican Chairman Alex Triantafilou and Democratic Chairman Tim Burke are used to the national attention that descends on this swing county during every recent presidential election. But this year, with two historically unpopular candidates, their jobs seem a lot harder. “We are just lowly county party chairmen who just try to piece it all together,” Triantafilou said. Follow a day in the life of Alex Triantafilou or Tim Burke . As party chairmen, they volunteer to find candidates to run for each local office and then help them win. They are the faces of their local parties – the last line of defense during this cringe-worthy year of politics. Last week was particularly brutal for Triantafilou. After the release of a lewd tape from 2005 in which Trump bragged about kissing and groping women, Triantafilou spent his day on the phone asking for advice from party loyalists and rallying troops at a volunteer center. Burke, who leads Hamilton County Democrats, hasn’t escaped controversy or infighting this year, either. The bitter feud between Cincinnati City Councilman Chris Seelbach and Mayor John Cranley, who are both Democrats, has quietly simmered, in part because of their strong mutual support for Clinton. But it will likely re-flame next year during the mayoral race. With three weeks to go until Election Day, Burke and Triantafilou are exhaustingly busy trying to keep up with their full-time law practices, plus putting in face time at evening fundraisers, calming the nerves of local candidates and overseeing the county Board of Elections, of which both are members. It is a strange dance for Burke and Triantafilou, who often appear at media interviews and debates together touting their opposing political views. And they have fought a few partisan wars over the years – such as the outcome of the 2010 judicial court race with Tracie Hunter. Through it all, both have kept their sense of humor. Ahead of an interview with WCPO, the pair coordinated to wear garb from their opposing alma maters. Burke, in a Xavier University shirt, and Triantafilou, in a University of Cincinnati sweater, laughed about their longstanding rivalry over the Crosstown Shootout. “Fighting with Tim is a natural state of being. That’s the way our democracy was set up - a two party system and we should have a healthy debate,” Triantafilou said. Triantafilou’s weekend took a jarring turn for the worst early in the evening of Friday, Oct. 7. That’s when news broke about an 11-year-old recording of Trump bragging about groping women. The fallout soon slid all the way down to Triantafilou. But even the bad days don’t dampen Triantafilou’s zeal for politics or, in his words, being a political hack. 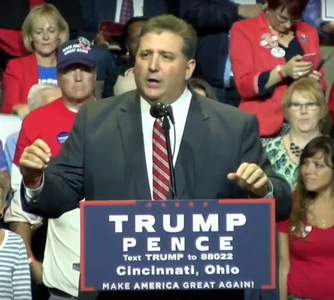 Days later, when the crisis had calmed, Triantiflou was busy fielding phone calls and text messages from the Trump faithful, who were begging for a VIP ticket or a handshake with the GOP nominee at an upcoming U.S. Bank Arena rally. Triantafilou led a rally for GOP nominee Donald Trump in Cincinnati Thursday evening. There are plenty of other text messages ranging from the silly – former Hamilton County Commissioner Greg Hartmann talking about the week’s Fantasy Football matchup – to the pressing: deadline-driven reporters seeking interviews about the election. Nothing, he hopes, will ever top the time he walked out of court just before 10:30 a.m. to 51 new text messages. Yet Triantafilou always finds the time to push his message on Twitter and Facebook, where he typically posts at least three times daily, often with his thoughts on the news of the day or praise for a local candidate. Even that can stir up controversy within his party as he gets accused of playing favorites if he talks up one candidate or attends one fundraiser over another. Triantafilou at a then-Republican Party presidential nominee Mitt Romney’s event in 2012. 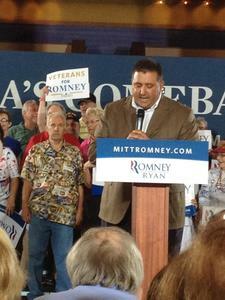 Fundraisers, spaghetti dinners and suburban Republican club meetings are his nightly election season routine. On Tuesday night, Triantafilou arrived at a meet-and-greet event for Hamilton County Commission candidates Andrew Pappas and Dennis Deters a few minutes before 6 p.m.. He barely had time to shake hands with the party’s Green Township host before a woman approached and asked if he could speak at an upcoming Oak Hills Kiwanis club meeting. “He’s got the worst job in politics – except for Tim Burke,” Hamilton County Common Pleas Court Judge Tom Heekin quipped that evening. Perhaps that’s why Triantafilou, a lifelong Greek Orthodox Christian, always visits a church on Election Day to light a candle and sit silently. Burke’s alarm sounded at 3:40 a.m. 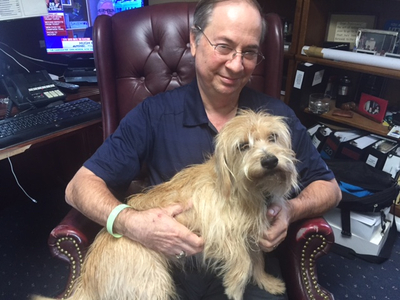 Shortly after 4 a.m. he was at his downtown Cincinnati law office with his terrier mix, Buster, who comes to work with him every day. Burke poses with his dog, Buster, at his Cincinnati law office Tuesday morning. With the start of early voting just a day away, it was clear this would be a busy Tuesday. After an 8:30 a.m. Board of Elections meeting where Burke calmed a woman complaining about voter fraud and okayed ballot preparations for Election Day, he was back at his office pouring through more than 100 emails. There was an Evendale Village Council meeting to get ready for that night, (he is attorney for both Evendale and Lockland) and preparations to be made for a visit by former president Bill Clinton to Cincinnati later that week. If there are no evening fundraisers, Burke is usually asleep on the couch at 9 p.m.
After 23 years as party chair, this is Burke’s sixth presidential election, so he knows the drill. Yet this year feels different. While he believes Triantafilou has the harder job of promoting and defending Trump, Burke has his own issues - such as county auditor Dusty Rhodes, a Democrat who routinely bashes Clinton and posts Twitter comments supportive of Trump. And Burke worries whether the unpopularity of both Clinton and Trump will smother voter turnout and hurt local candidates, such as Denise Driehaus who is running for county commissioner. Whatever happens between now and then, Burke’s tradition will unfold as usual on Election Day. He will arrive before dawn at the Board of Elections with several dozen donuts. He’ll monitor how polling equipment is working, and drive out to any problem precinct. 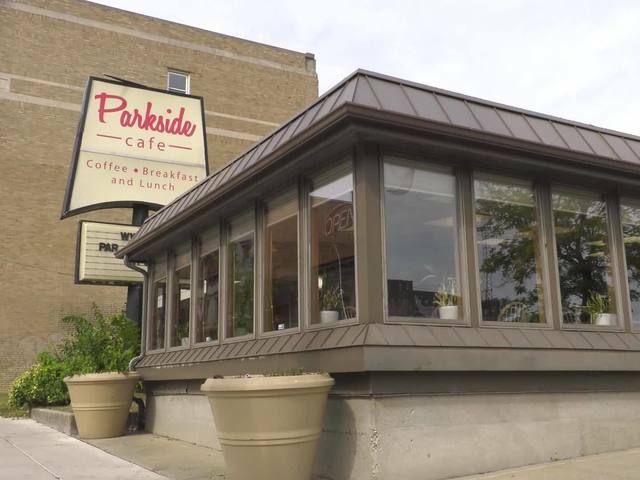 Some years he has lunch at Price Hill Chili, cordially shaking hands with Republicans who sit on the opposite end of the restaurant. Then he’ll watch the results and keep his fingers crossed. When it’s over, he’ll go to Disneyland with his wife, two daughters and grandchildren for a week. After that? Well, Burke hasn’t decided how long he’ll stay on as party chair. “That’s a question I continue to ask. I will be 69 in February. It’s something I think about,” Burke said. But Burke is not sure he’s prepared to give up the best part of the job: helping young candidates win their first offices. He still remembers David Pepper and John Cranley both fresh out of law school, long before Cranley became mayor and Pepper won a county commission seat and later state party chair.